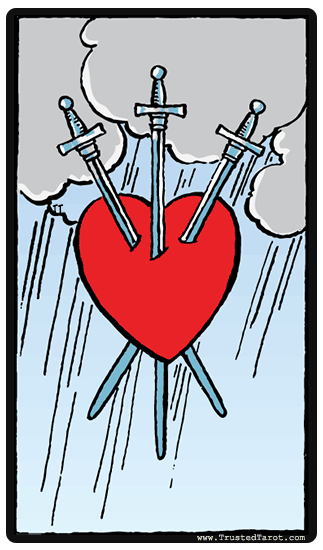 The Three of Swords depicts the message of rejection, betrayal, hurt and discouragement. In moments like these, we are well served by the mind. If you can think logically about it and prepare for the experience, the impact of this pain may be minimized. But remember too, that pain and grief are a normal part of life, because they make us appreciate what joy and happiness we have, as well as teaching us. It is through pain that we learn to be avoid mistakes that could lead us into danger and grief. It is therefore a necessity in the journey of life. The Three of Swords therefore is a depiction of suffering that is meant to make us stronger, more careful and more vigilant. Sometimes life gives us no choice - we are knocked down. But what determines one's future is the choice of whether to remain down, or rise again. Sometimes life gives us no choice - we are knocked down. But what determines one's future is the choice of whether to remain knocked down, or rise again. Each little piece of suffering you encounter serves as a stepping stone to find a deeper meaning in this world. This card comes at a time when you need to prepare yourself for this next stage in life. While the grief may be extremely hurtful, it enables you to forget your past and focus on your future knowing that you have control of what actions you take afterwards. Don t dwell so much on what is troubling you but instead, focus on what is approaching, because you determine your fate. The Three of Swords reversed indicates that have faced a recent loss, a break-up or a moment of grief. You may be still recovering from this, and your emotions have not completely calmed, making it difficult to move on. Although you may still be thinking of your past suffering, this card may be a signal that it's time to let go and look forwards towards life ahead of you, because there is much for you to enjoy. Many don t see this, and they end up being immersed in their own pain for too long, delaying their own recovery process. Don t focus too much on what happened, renew your emotions and gather your courage. The reversed Three of Swords card is here to let you know that all difficult moments pass - they are not there to stay, and when we fall, we can also rise again.